"The more that you read, the more things you will know. The more that you learn, the more places you'll go." - Dr. Seuss, I Can Read With My Eyes Shut! LiteracyPlanetʼs reading content provides students with hundreds of extracts to develop and improve their reading fluency. Being able to read is an essential skill, and reading proficiency is assessed in national standardised tests for school students in English speaking countries periodically and from a young age. LiteracyPlanet’s rich and comprehensive phonics and sight words content provides the building blocks for developing strong reading skills. With engaging and colourful digital texts in a wide range of subject categories, LiteracyPlanetʼs reading content provides students with hundreds of extracts to develop and improve their reading fluency. Subject categories include creatures, disasters, discoveries, mysteries, people, bizarre and sport, and each text is classified according to the most widely used reading levels: Reading Recovery, Fountas & Pinnell, Developmental Reading Age (DRA), Rigby, Lexile and Wings. LiteracyPlanet’s reading extracts also cover 13 different comprehension strategies to develop both literal and inferential comprehension skills. 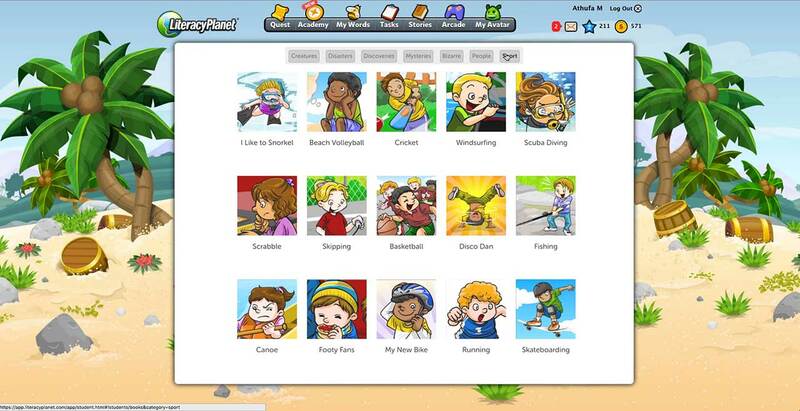 Students have a choice of modes when completing LiteracyPlanet reading exercises, fluency mode or reading mode. Fluency mode records the words read per minute, and audio support for students to hear unfamiliar words. These unfamiliar words are highlighted and voiced when the extract is played back at the recorded fluency rate, and identified in the teacher report. Reading mode allows students to read the text independently. Both modes feature general multi-choice comprehension questions to ensure that students have read the extract.